Pinion Ridge overlooking Hwy 550. This was taken from point A shown on the GPS map below. In the far background at the upper left you can see Grand Mesa. 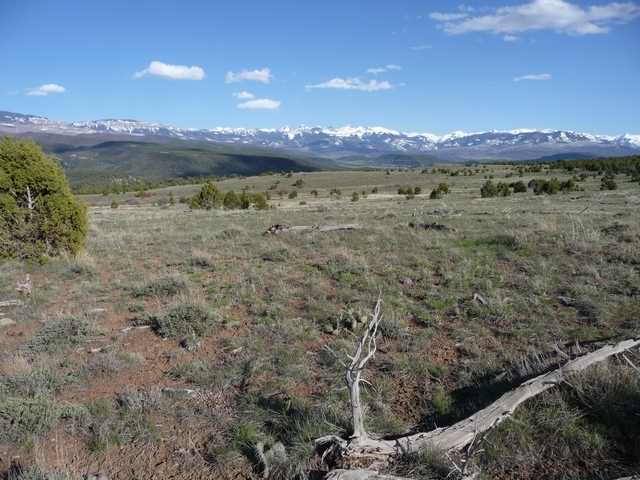 Directly across the Uncompahgre River from where we live is a geological feature that consists of Pinion Ridge and McKenzie Butte. I was up there a couple years ago and found the area quite beautiful. I returned last Wednesday and again Friday with the goal of exploring every nook and cranny. I nearly succeeded. 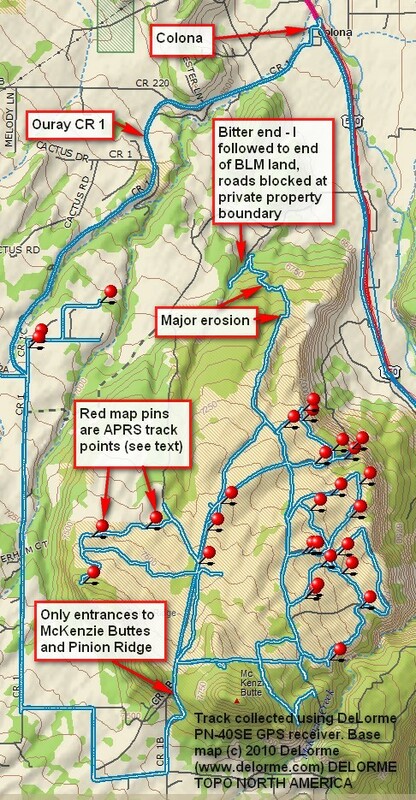 The annotated GPS track is below, and below that a map showing how to access the area. 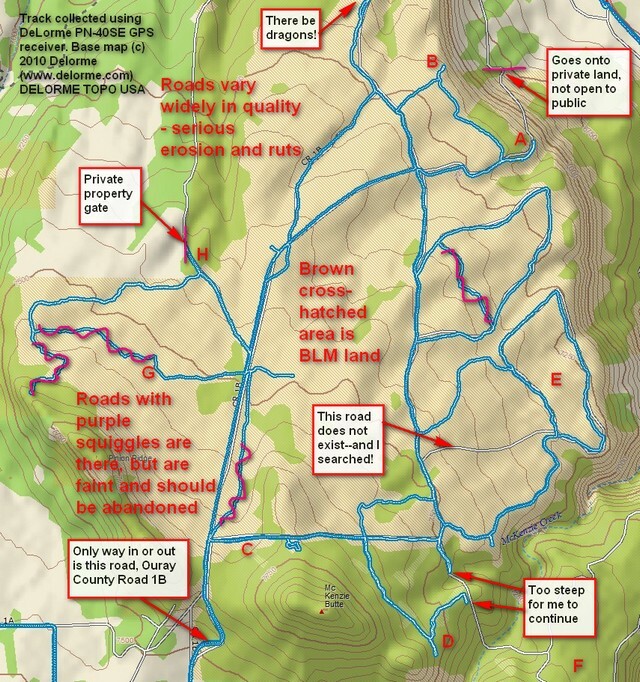 GPS map of Pinion Ridge / McKenzie Butte. See text for descriptions of the areas marked by capital letters. Pinion Ridge vicinity map. The area can easily be accessed from Colona, CO. From there travel on Ouray County Road 1 and then turn off as noted. There's only one way in and out, and that's on County Road 1B. A. This point is easily accessible and overlooks part of the canyon that’s further north from where we live. The viewpoint is shown in this post’s lead-in photo. Note that BLM owns the land down to the valley floor (the area with the fine brown cross-hatchings is BLM), but it’s private land thereafter. I opted not to go down the road (although there were pick-up-sized tire tracks) because I feared I’d find myself at a locked gate with no place to turn around. BTW, the road from A to the north is clearly visible from Hwy 550 below. If you look in the very upper right corner, that blue line is Hwy 550. B. This again would be a nice viewpoint. The road went up here and then suddenly terminated. My guess is it’s used as a campsite. C. As you enter the area, turn right onto the road marked with a C. Note that the stretch from CR 1B until the little squiggly that marks a campsite is in absolutely terrible shape. Rocky, rutted, and not much that can be done about it. It doesn’t last long—past the campsite it’s not too bad though rutted. D. My goal, as I said, was F. At first I went to the T and then turned south. The road is well-used, but I came to a place where the road plunged steeply downward into a ravine and then equally steeply upward. I was alone and worried I’d get down there and then couldn’t get out. I backtracked, determined to follow every road to the south. The one that ends at D is a lovely and well-defined road that winds through the trees (see photo below) and circumvents the ravine. It took me to the road to F, but then I was faced with yet another ravine! So I opted to exercise discretion. Note the little “appendix” at D headed south. It’s a road that terminates rather suddenly; I suspect it’s used as a campsite—quite a secluded one at that! Lovely road on Pinion Ridge winds through the trees. This was taken on the road that leads down to Point D.
View of Pinion Ridge from the road northwest of E. The view is to the southeast. Stunning! Those are the Cimarrons and Sneffels Ranges in the distance. Please pay particular note to the soil, not completely covered with vegetation. This is erosion waiting to happen. Even the tiny track left by a motorcycle can induce erosion--stay the trail! F. This is the area I went up there to see, but is inaccessible. If I can find someone to go with me, I’ll try Road D again—the aerial photos indicate the road shouldn’t be too bad. G. There’s a small cachement basin there to collect water. The ridge is quite arid. This is the only development in the entire BLM area and a sign begs visitors to leave the cachement area alone. I did. Note the sections of road with a squiggly purple line. These are in fact roads, but they’re faint. I’ve marked several sections of roads that way. If I were the BLM, I’d put up a sign saying these are closed to vehicular travel. But I’m not the BLM, so all I can do is urge you to let these stretches of road return to nature. H. The good road ended at a gate with lots of No Trespassing signs. I make it a practice to heed these. When I got home and looked at my GPS track, I discovered that the gate is where the BLM land ends. Let me say just a little about the road that heads north, marked “There be dragons!” The road is on the DeLorme base map and certainly exists. I suppose it’s still there to serve hunters. As you go north, the road quality deteriorates. The road follows the descending ridge to the north and has seen major erosion. I had no trouble with the motorcycle, given I only need a path a few inches wide, but I was often riding the crown between the deep ruts—ruts that were a couple feet deep in places! And, as you get to the very northern part of the road, visible in the vicinity map above, the road gets very rocky, with moderate scree, though not terribly steep. In fact, I was careful not to travel any road I didn’t think I could backtrack, but I didn’t want to backtrack this one. But I had to, as the road is blocked with No Trespassing signs where it meets the northern boundary of the BLM land. So…I got to backtrack, which I did without any problems. 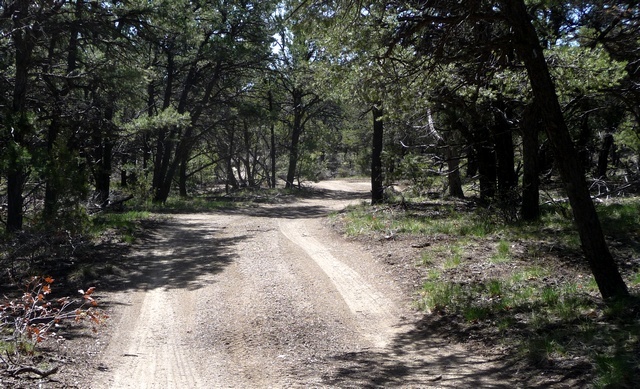 I think many of the roads on Pinion Ridge were put in when the BLM chained the area, and are kept open by hunters and campers. Given how easily the land erodes, please, please don’t go cross country! But the area has a haunting beauty and from places like A and E, has stunning views. This entry was posted in GPS Tracks, Motorcycling, Ouray County and tagged BLM land, McKenzie Butte, Pinion Ridge. Bookmark the permalink.